1.LPG Centrifuge Spray Dryer for Fruit Juice Power/Fruit Powder/ Mango Juice with fast drying speed can constantly evaporate 95%-98% moisture. The drying time is about 5 seconds to 15 seconds. 2.This Fruit Juice Power/Fruit Powder/ Mango Juice Spray Drier and Drying Machinery has excellent uniformity, liquidity and solubility as well as high purity. 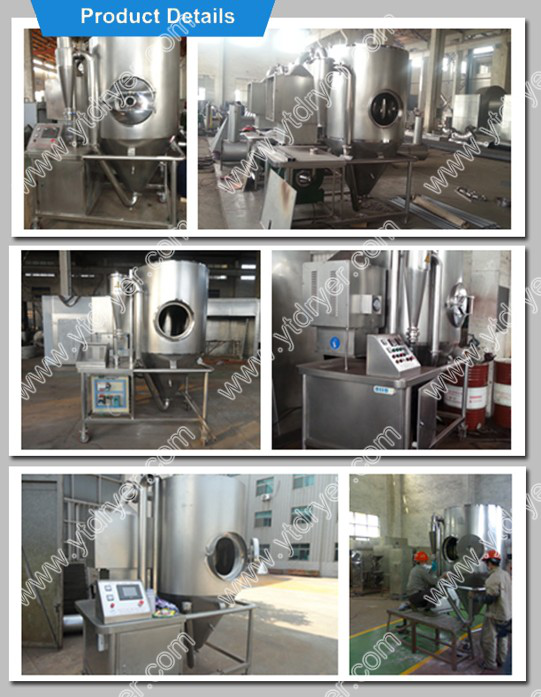 3.This Fruit Juice Power/Fruit Powder/ Mango Juice drying machine has simple production process and easy operation. After drying, it does not need to grind and screen, which can reduce production procedure and enhance the purity. 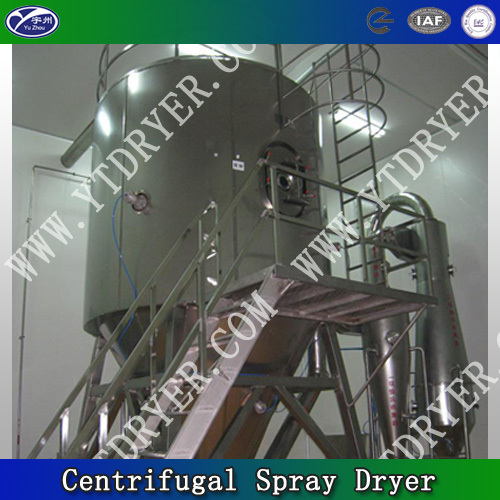 Centrifugal Spray dryer machine for Fruit Juice Power/Fruit Powder/ Mango Juice is a kind of dedicated equipment for drying emulsion, suspension, paste and solution. 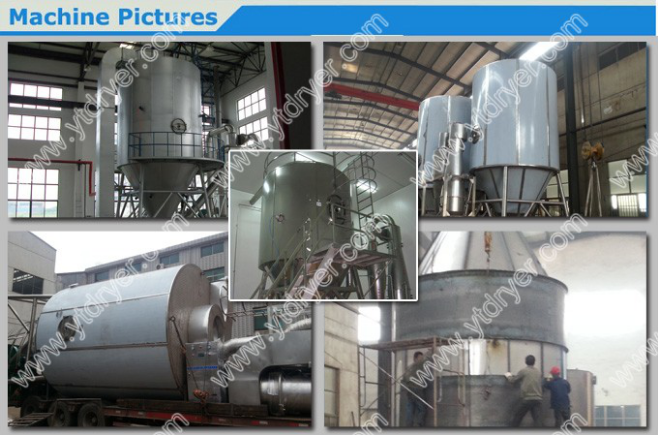 After filtering and heating, the air enters into the hot air distributor at the top of the Centrifugal Spray Drying Equipment for Fruit Juice Power/Fruit Powder/ Mango Juice, and the hot air will spirally and evenly goes into the drying chamber. The material liquid via high-speed centrifugal atomizer rotates into extremely thin vaporific liquid globule and parallelly flows with the hot air, and then the liquid will be dried into powdery products in a very short time (5-10 seconds). The waste gas after filtering will be expelled through the fan. For the wet organic solvent materials, the Fruit Juice Power/Fruit Powder/ Mango Juice drying device can be designed with closed cycle process. It can utilize cyclic nitrogen to dry the materials. 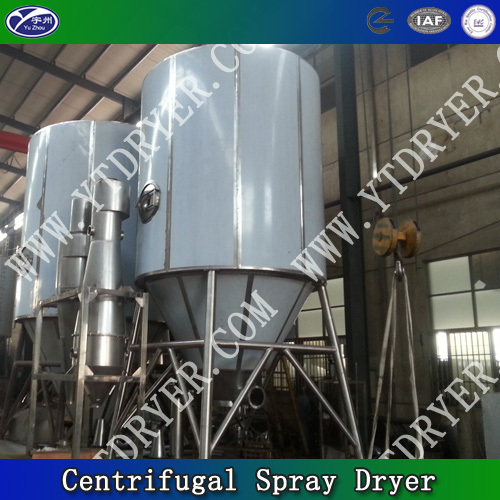 Looking for ideal Juice Spray Dryer Manufacturer & supplier ? We have a wide selection at great prices to help you get creative. All the Juice Drying Machine are quality guaranteed. 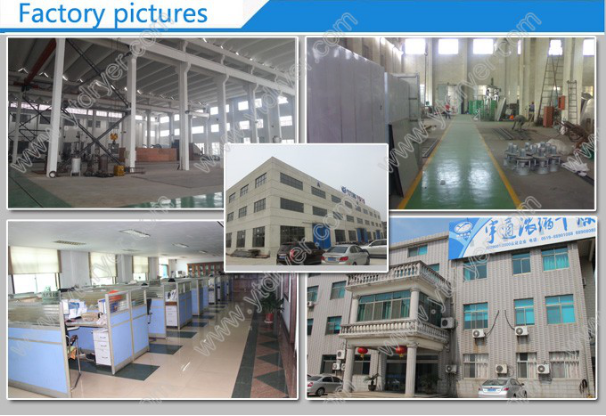 We are China Origin Factory of Juice Dryer Machine. If you have any question, please feel free to contact us.